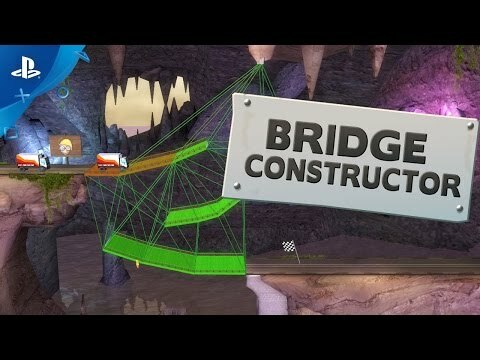 Construct bridges over valleys, rivers and canyons to get vehicles safely to the other side… or watch them fall into the abyss together with your crumbling bridge. Create and design your own constructions and watch various vehicles pass over them - or see them fall and crash while your inferior creations collapse due to weight and the laws of physics! The island nation of Camatuga was struck by an earthquake which destroyed the bridges on every island. Help the citizens of Camatuga to rebuild their - sometimes rather unortodox - bridges! Choose in over 60 levels between a range of materials for each individual bridge, like wood, steel, cables, or concrete pillars. Use the appropriate materials and stay within budget to build the perfect bridge. The choice of materials enables you to build each bridge in almost infinite variety – your budget is the only limit.